Scroll down to read summaries of recent news related to chemicals, human health, and the environment. Different stories relate to different units of CHEM-2. Do you know if there is a chemical plant in your community? 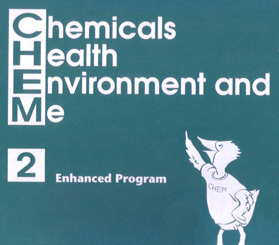 Has there been a chemical accident in your community within the last five years? Do you know what to do if an accident occurs? If you answered "no" to these questions, you are like the majority of people in the United States, according to a study done in 2003 by the State of Texas’ Engineering Experiment Station's Process Safety Center. The study found the top five most released chemicals in the United States in the last 10 years were: ammonia, chlorine, hydrogen, propane and formaldehyde. It said chemical spills with related injuries and fatalities are probably declining, but no one knows for sure because the information is not nationally tracked.
" We need to have a better informed public—where the public trusts the information coming out of the chemical industry—so people are better able to deal with emergencies such as chemical incidents," said Dr. Sam Mannan, director of the study. "Public trust is essential for improved safety." Is Noise Affecting Your Brain? Scientists have found that noise affects the brain development of infant rats. Researchers at the University of California, San Francisco, exposed infant rats to continuous "white noise." White noise refers to the relatively low-level continuous sounds in the environment, such as the sound of electronic equipment or traffic. The noise level was not high enough to cause hearing loss, but it did prevent the rats from hearing normal sounds from the environment early in life. Using electrical probes, researchers were able to map the organization of the auditory parts of the rat’s brain. They found that rats exposed to white noise early in life did not have the normal brain organization for sound that other rats did. However, if the rats were exposed to normal sounds later, their brain was able to compensate and reorganize itself normally. Researchers say the increasing amount of white noise in the environment may be why more and more children are language-delayed or have speech problems when they are young. Everyone uses batteries, and it can be expensive and time-consuming to replace them when they run down. Even rechargeable lithium batteries only hold their charge for a few days. Researchers think they have a solution. Chemist Thomas Luther developed a polymer membrane he calls "an inorganic version of plastic kitchen wrap." It allows the positively-charged ions in a lithium battery to create an electrical circuit, but it won’t let the negative ions pass through. It is the negative ions that are responsible for batteries running down. He estimates his batteries will be able to sit for 500 hours with no loss of power. His battery doesn’t yet generate enough power to be competitive with regular batteries, but he is confident that the problem will soon be solved. The polymer membrane can be modeled into any shape. It is also very tolerant of temperature extremes, so it could be used at temperatures below freezing, like in space. A new no-calorie sweetener may be in the food you eat. It sold under the brand name of Splenda®. It was first discovered in 1976 and approved for limited use in the United States in 1998. In July 1999, it received approval for unlimited use. Splenda®, or sucralose, is made from sugar. It is made by replacing three hydrogen–oxygen groups on the sugar molecule with three chlorine atoms. This slight chemical change means that the human body cannot break it down. As a result, a person would not get calories from it. Since its discovery, there have been more than 100 scientific studies on it. Causing virtually no side effects, it has been proven to be safe in animal and human trials. Unlike other artificial sweeteners, it can be measured in quantities similar to sugar and stored for long periods of time. It also holds up to heat, which means that it doesn’t lose its sweetness in cooking. In 2001, the American Academy of Pediatrics recommended that health professionals and consumers stop using thermometers or other devices containing mercury. Mercury is a toxic element that can be absorbed through the skin or inhaled as it vaporizes. The ingestion of even small amounts can cause neurological damage, particularly in infants and small children. In May 2002, researchers at Rutgers University College of Pharmacy and the University of Medicine and Dentistry of New Jersey asked 80 different groups, including public health agencies, how mercury thermometers should be disposed of. Only a third of the groups who might be contacted about or responsible for disposing of mercury responded correctly. Thirty-six groups recommended throwing them into the trash; 19 said they didn't know and suggested calling someone else; and 19 suggested taking the device to a specific site, such as a hazardous waste center. As a hazardous waste that could contaminate water and food supplies or be ingested by wildlife, mercury should always be taken to hazardous waste disposal facilities.